Mahen Panchal is one of Leela's guru brothers and is affectionately referred to as broodbhai because he just loves to brood over every word of the Bhagavad Gita. Something magical happens when Mahen starts to chant the Gita. His voice is strong, his enunciation is wonderful, and he makes it possible for inexperienced Americans to chant along even if they have never seen transliterated versions. The first time Mahen chanted the Gita here was in a tent at the temple site. Mahen was joined by Rameshbhai Panchal, Kiritbhai Shah, Thakorbhai Patel, Priya Hossack and Leela. We started at daybreak. Every time we chanted a verse that mentioned light - the sun would come out and shine on our page and when the verse was over, the sun went behind a cloud. We chanted the Gita on labor day weekend 2002 after a picnic. Hans Van Latenstein played the harmonium and we chanted Hare Krishna for an hour. Then we chanted the Gita for 2 hours and took a break for more Hare Krishna chanting. After finishing chanting the whole Gita in Sanskrit, we sang Hare Krishna mantra again. Labor day weekend of 2003, Mahen and Usha again lead the entire Gita in Sanskrit. Mahen is caring for his mother, Radhaba, Bapuji's oldest living disciple. 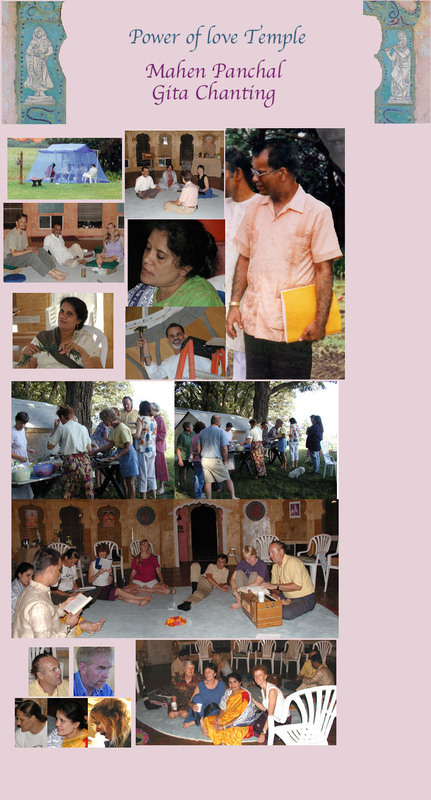 In 2004 a few of us went to Chicago and enjoyed chanting the Gita. The vibrations of the gita infused and sanctified the space and fed our souls.